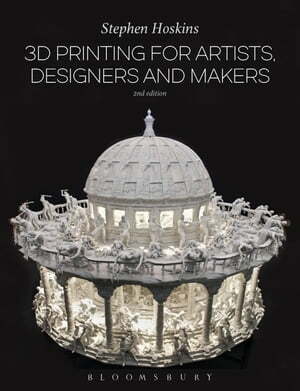 Collins Booksellers - 3D Printing for Artists, Designers and Makers by Stephen Hoskins, 9781474248747. Buy this book online. Fully revised and with a new chapter and international case studies, this second edition of the best-selling booktraces how artists and designers continue to adapt and incorporate 3D printing technology into their work and explains how the creative industries are directly interfacing with this new technology. Covering a broad range of applied art practice – from fine art and furniture-design to film-making – Stephen Hoskins introduces some of his groundbreaking research from the Centre for Fine Print Research along with an updated history of 3D print technology, a new chapter on fashion and animation, and new case studies featuring artists working with metal, plastic, ceramic and other materials.